Got him in training already? Great. Looking very smart and stylish. AJ for the layup. I'm floored! How amazingly cute is that? Wow! I am just bursting with baby joy!! He is absolutely adorable! Believe me, not all babies are cute, even my youngest was not a cute baby. I am so happy for you and Brooke. Phil and I are sending you 3 a little something. It will probably be mailed out by the end of the week. 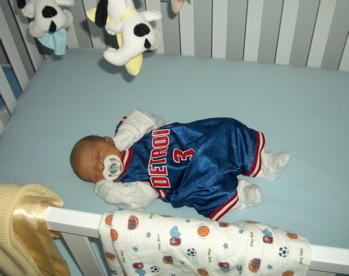 My first response to this pic- He's already a Piston!! WooHoo! Um, Phil cannot find your address. If you could email it to me, that would be great. My email address will show up when you moderate the comments. No way he goes bulls. No way. You'll train him right. This page contains a single entry by danny published on March 8, 2006 5:47 PM. I'm a Daddy was the previous entry in this blog. The Andrew Show is the next entry in this blog.